Saving for retirement is something everyone knows they need to do, but perhaps they don’t know how to go about it or are too busy. We all have some bad money habits that we need to shake off. If you don’t even know how bad or good your financial habits are, that’s okay too. Many people are not “on top of” their money habits. The key is in being open to learning new things, taking in strategies and ideas which can help you succeed monetarily and be willing to change. In just a moment, you can learn how to develop good money management habits that will positively impact the savings you have and wish to grow. Earn more monthly by starting with a change. Luckily, there are numerous ways to boost your retirement savings. As scary as it can be, thinking of the future is necessary. Gain some good money habit hacks and start your retirement savings journey now! 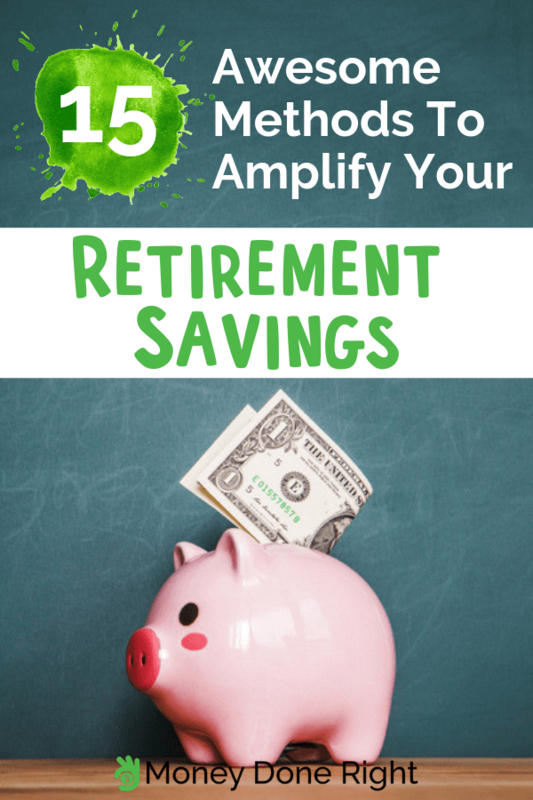 Click here for more great tips on when to start saving for retirement. One of the best ways to boost your retirement savings is to earn more monthly. That’s where SurveyJunkie comes in. When you sign up with SurveyJunkie, you get paid to provide your opinions about certain items so companies can ultimately design better products. You start off by sharing some personal information such as how much shopping you do for your household, key demographic info like income, gender, and relationship status, health habits, personal interests, pet ownership, and household technology use. This information is necessary for brands to see if you’re their demographic or not. If you’re not, and come across a “We’re sorry — you did not quality for this survey” message, don’t worry – there are plenty of other opportunities! After creating an account you’re a SurveyJunkie member. This means that you can start filling out those surveys and earning extra income. For each survey, you get awarded points at a 1 point to $0.01 ratio. That means that when you rack up 1,000 points (or $10) then you can redeem your points for cash via PayPal or electronic gift cards. Start earning more monthly by simply filling out surveys with SurveyJunkie! If you’re thinking about increasing your retirement, consider starting out with an investment app that will help you in the long run. When you invest with Fundrise, you choose investments which are not traded on a public exchange. Instead, they’re for those with more of a long-term outlook. Investors can choose between four investment portfolios, including seven eREITs and three eFunds in either the Starter Portfolio, Supplemental Income plan, Balanced Investing plan or Long-Term Growth plan. There are minimum investments of $500 for the Starter Portfolio and $1,000 for the other three. But, while it may seem like spending money, actually it’ll make you money in terms of average return — Fundrise investments in 2017 had a 11.44% net of fees. There’s also the ability to try it out for 90 days to see if it’s the right fit for you. If it’s not, then Fundrise gives you your money back at the original amount! Click here to get started with Fundrise and begin investing in private real estate assets for as little as $500 today. Many students are already aware of just how much good money habits matter to saving the money they need to start their life after graduation until future retirement. Good money management habits are the backbone of boosting any retirement savings plan. If you’re saddled with a student loan that is making even the word “savings” laughable, then Credible is for you. Credible is a student loan marketplace which allows borrowers to shop around for student loan refinancing and private student loans, as well as personal loans. If you’re hoping to get a better interest rate or lower your payment for your student loan debt, one of the best things you can do is to refinance it. Credible allows you to fill out a single form, compares multiple lenders at once for you and finds you the best possible rates and terms for your student loan. Refinance your loans and make your student loan management easier by getting personalized rates on Credible today. Speaking of how to boost your retirement savings, there’s actually an app for that, and it’s called Blooom. As a 401(k) management app, Blooom manages any 401(k), no matter where the account is held or where the account holder works. There’s no need to get your employer involved with your Blooom account. As a beginner, you can have Blooom manage your accounts right from the start, which gives you a better shot at starting off on the right foot — especially for those who don’t exactly know what they’re doing. Create a Blooom username and password, share some information, then securely link your 401(k) and log into the site. Blooom will then review your fees and asset allocations, compare them with recommendations and suggest ways for you to improve. Blooom can help you start identifying smart money habits which work for you. Why not use the 401(k) retirement app for exactly what you need — help with retirement savings and growth? Click here to sign up for Blooom and rest easy knowing that your retirement account is being managed by a team of financial experts. Healthy money habits start with knowing how much you have, are spending, and need to be saving for retirement. If you’re looking to increase your retirement savings, then you absolutely need to know the ins and outs of your credit habits. Credit Sesame is a free credit service that offers free credit reports, free credit monitoring, and even free identity theft insurance. The basic account offers a free TransUnion credit score and $50,000 in identity theft insurance for free. You may think that these items are unnecessary, but as anyone with smart money habits will tell you, they are important predictors of where your money is going and will go in the future. Credit Sesame also offers premium services, including access to a bunch of other tools such as black market website monitoring, Social Security Number monitoring, and change of address monitoring. Credit Sesame is very secure, considered safe by Norton, McAfee and ETrust. They’re also BBB accredited. Sign up for Credit Sesame for free and get your free credit score and free credit monitoring service. Again, another way to grow your retirement savings is to invest. Acorns is a great opportunity for that. The app works like both a “piggy-bank” and an investment platform in that it takes any spare change that accrues from your transactions and invests it. The Acorns investing app automatically rounds-up the value of each transaction you make and channels your spare change into a holding account. For instance, if you make a purchase worth $9.25, Acorns will automatically channel $0.75 to your holding account for investment. You have to input your financial goals in the app and it will develop a custom investment portfolio based on your preferences. What’s even better is that you can get an initial free deposit in your Acorns account for shopping with certain brands through the Acorns app. Click here to download Acorns and start getting free investment money today! If you’re thinking of retirement, then thinking about estate planning is a must. Save money by choosing an estate planning company that won’t charge you through the roof in fees. Trust & Will makes estate planning easy. In just 10 minutes they can help you create a customized, state-specific and legally valid Estate Plan. They break down estate planning into accessible terms and affordable prices. They can help you navigate your trust, your will and any guardianships you need to appoint. This is an extremely easy way to set up your estate just in case, with minimal fuss and immediate benefits. Also, if your situation changes, you can absolutely log back in and make edits to your plans. With an automated program to help you through the process, and easy terms broken down into actionable steps, Trust & Will can help you save money when you complete your estate plans. Click here to sign up for Trust & Will and create a personalized and fully valid estate plan! Sometimes we all need help creating good money habits. Now, there’s a smart financial decision motivator, an app changing the way people interact with their savings. The Long Game Savings app helps to prepare people financially and also provides fun ways for people to turn savings into a game. Once you download the Long Game app, you need to create an account and link your bank information. You can then fund the account for as little as $5. When you fund an account and set up recurring deposits, you earn free coins to play games. Long Game is designed as an easy online savings account, meaning it can help you boost your retirement savings because that’s what it’s made for! All the money you save is FDIC insured and held through Long Game’s partner bank, Blue Ridge Bank. On top of the money you already have, your account will earn 0.1% interest. This app is designed for people who may need that little extra incentive to save, such as coins and games which could win you more money. Click here to sign up for Long Game Savings and start earning rewards for making smart financial decisions. A long-term way to earn money and improve your health is to sign up for HealthyWage, a platform where people can get paid for losing weight! It may sound like a scam, but it’s really true! If you set your goal, stick to it, and lose the weight you’re planning to, the company will really pay you. There have been glowing reviews of HealthyWage across the internet with people winning $2,400, $2,500 and even $3,180 for losing the weight they bet themselves they’d lose. If you want to make extra money and want to be motivated to change your fitness, then the HealthyWage challenge is a perfect fit for you. It’s not a diet program or a weight-loss program. The person who signs up is in charge of everything from their diet to their exercise; the only thing that matters is your goal and if you meet it or not. If you’re not sure if HealthyWage is right for you or not, then start at the HealthyWage Prize Calculator and go from there. You bet every month your challenge takes. If you don’t meet your goal the money you bet gets put into HealthyWage’s pocket, for use with other betters. If you do meet the goal, then HealthyWage pays you more than what you bet as a prize. Sign up for a HealthyWage account today and start your fitness journey to get healthy and win money! Do you like shopping? If so, this is an easy way to boost your retirement savings without changing your current shopping habits at all. If you sign up with Ibotta, you can get cash back on the purchases you’re already making, from groceries to hotels and everything in between. The Ibotta app provides access to multiple cash back offers with different top retailers and vendors. When you sign up, you’ll have to fill out a questionnaire with your favorite places to shop. The app will immediately start displaying cash back offers from your favorite stores on your home page. All you have to do after you buy something is to upload your receipt and get ready to boost your income by getting cash back on your purchases! Click here to sign up for Ibotta, get a $10 signup bonus and start earning cash back on your everyday purchases! Everyone knows about Airbnb by now. But have you actually considered renting out a room, floor or property that you’re not using? This is a tip for those with good money management habits. You can make quite a significant amount of cash if you know how to spruce up a property and then list it for maximum reach. To get started with Airbnb, all you need to do is sign up for free. Perhaps it’s a good idea to check your insurance policy if you’re renting a location to see if it is allowed or not first. When everything is okay, then you can get busy taking amazing photos with lots of natural light and an airy, open feel. You also need to write an accurate description but using language that would draw a potential buyer in, despite how poky or far from public transport the place is. For those willing to go the extra mile, renting out an Airbnb property can provide some side hustle income flow or even main income salary if it takes off enough. Sign up for Airbnb today to list your property and start reaping the rewards of becoming a host! Today, Avon is one of the best known self-employment opportunities in the world. It’s a great way to earn some extra cash and increase your savings if you feel up to the challenge. Avon has a global network of almost 6 million representatives who are contracted and paid through their network marketing system. It’s pretty simple to sign up with Avon, too. That’s because signing up new representatives is one of the most lucrative things a representative can do. There will be no shortage of people to help you start your new Avon career. The sign-up process usually involves two pieces of paper and a $15 sign-up fee. Then, you’ll be given your Avon start-up kit which includes all the information you need to know about running an Avon business. During your first campaign, you will earn 50% of your sales, not including items that are capped at 20% such as clothes, shoes and jewelry. In fact, as long as you sell $50 worth of products in your first campaign, you’ll get that 50% earnings on your next three campaigns too. After your fourth campaign, earnings are based on your total sales. If you are ready to sign up, click here to complete a quick online form and join Avon today! Wealthsimple is another investment opportunity for people looking to increase their savings. It has diverse portfolio choices, including socially responsible options that align with your beliefs, clear pricing of $0 minimum and fees, and unfettered access to certified financial planners for all clients, regardless of how much money you have. In fact, Wealthsimple will manage your first $10,000 for free for one year when you sign up. This app is best for socially responsible investors, beginning investors, tax-loss harvesting, automatic rebalancing, and access to financial planners. Another specific benefit of Wealthsimple is that it offers a halal investing portfolio that complies with Islamic law. It contains about 50 individual stocks screened by third-party committee of Shariah scholars to make sure that no companies benefit from gambling, alcohol, firearms, tobacco, or any other restricted industries. Since Wealthsimple started business in the U.S. in 2017 (coming from being the largest Canadian robo-advisor firm), it has added a few more perks, including: a VIP Priority Pass membership, Smart Savings account, Roundup feature, and free portfolio review. Ready to start investing with Wealthsimple? Click here to open an account and collect a $50 bonus if you fund your account with $100. Want to improve your money habits but don’t know how? Well, an excellent way to make more money every month and boost your retirement savings is to put your finds in a high-yield account. For example, did you know that most savings accounts at brick-and-mortar banks offer less than 0.10% interest rates? Meanwhile, in high-yield accounts, you could earn up to 20 times more! If you have a bank account, routing number and your Social Security number, you can usually open a savings account at a financial institution’s website in under 20 minutes. You can click their links to apply then enter your information. Consider setting up the funding for the account by electronically transferring money. It doesn’t take any more effort to save money more one way than the other. The only difference is how much money you make and can put away from retirement! For those looking to start saving by making a change, this is the action for you. Good money habits don’t just develop overnight so don’t worry if getting into the rhythm of the new account takes a bit longer than you anticipated. Before long, you’ll be earning way more in interest rates than you were before. And all of that can go directly into your retirement savings! Want to make more money but don’t know how? Click here for many, many good ideas! Following on the previous smart money habit tip, once you have a savings account that earns a good rate, the next step is to set up an automatic payment plan to make regular deposits for you. If you set up an automatic transfer each time, you don’t have to worry about consciously saving money for retirement — it’s already being done for you automatically! Also, since the transfer places the money from checking into savings, you can’t access it using a debit card, meaning you may be less tempted to spend that money. To start, log into your checking or savings account online and select the option for bank transfers. You can choose the money amount, length of time and frequency. Once you have it set up, then you can just “set it and forget it,” as the saying goes. As long as you’ve set the length of time long enough, you won’t have to worry about doing anything again for a while! Don’t know how to start making some side hustle cash? We’ve got you covered. Click here.